Oops - we don't appear to have a video for the fi-5220C. 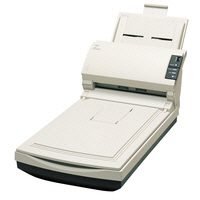 The scanner is quick to set up, fast, reliable and easy to operate. However it has one big negative point in the Automatic Document Feeder. It is claimed this will handle 50 sheets when in practice it has difficulty coping with 15. We have never managed to get it to operate with 20 or more sheets (80-90gsm) paper on the input chute and it generally only works consistently with a maximum of 12 - 15. This is not a problem for us, but could be a major headache for users with long scanning runs. I found the scanner easy to set up, and use once installed. Installation was tricky due to us using MS terminal services but setting up on a local machine couldn't be easier. Scan quality is good with plenty of options within the software. OCR is also of a high standard and recognises almost 100% of text scanned, even on low quality proofs. We have been impressed with the Scanner. To date it has been very reliable. However we have had a problem with the power cord. We were very impressed with the support received to rectify this problem. The only problem we have with the scanner is no matter what software we add it will not allow us to scan on paper in duplex form. The scanner does a very good job for the level of work we use it for. The Fujitsu Fi-5220C document management scanner replaces the Fi-4220C2, offering faster scanning and ultrasonic multi-feed detection! The Fi-5220C offers high quality output resolution up to 600dpi. Control over error diffusion, colour dropout and gamma correction via the driver allows a wide variety of documents to be scanned. The user selectable black background enables the use of document deskew and autocropping of mixed document and high quality scanning of thin documents. With a slide away output tray the Fi-5220C can be positioned near the users workstation for ease of use. When not in use the scanner reverts to a standby mode using only 6 watts of power. The Fi-5220C has both an industry standard SCSI and USB 2.0 interface as standard.